It has been a while since a MCM Property of the Week. To tell you the truth, there haven’t been many midcentury homes popping up on the local realestate radar! Also of note recently is the demolition of two architecturally unique Beaumaris homes (including this previous Grass-trees property of the week). There has been plenty of debate across the local social media pages about these homes, so I’m not going to get into the rights or wrongs of property owners to demolish and re-build. It’s their property and their decision of how to treat it (within the regulations of the local authorities of course). What concerns me is that we truly live in a throw away society. The fact that it can make more economic sense to demolish a structurally solid home and build another in its place is quite troubling. I am constantly disturbed to see the Metricon signs around our suburbs that blatantly state “Knock-down and rebuild” as their catch cry, and their other slogan “Love where you live”. In two sentences they are selling the idea that you own a great property in a great location, so why not moonscape the block and build something different. What makes a suburb such as Beaumaris so beautiful and a sought after location to live in is the architectural character of many of the houses and the amazing natural setting in which they were designed and built. With the sub-division of Beaumaris by the Dunlop Rubber Company in the 1950s it created the perfect opportunity for a new wave of architects to design unique homes amoungst the remnant Tea-tree, Eucalypts and She-oaks. Sloping sites on the ancient sand dunes were treated appropriately with site-specific design and significant vegetation was used as a design feature rather than a constraint. Just one of the many site-specific and architect design homes in Beaumaris (Chancellor & Patrick 1962). Living in a house built in 1956 and now one from the 1960s has taught me that while weathered and aged, these homes are structurally sound, cleverly designed and well-built. Often the structural components of the home are on display and these add to the architectural beauty. In an era where Robin Boyd was discussing ‘facadism’ in ‘The Australian Ugliness’, the architects of this time were not hiding their structural materials behind render, stacked stone cladding or Alucobond panels. Restrictions on the use of building materials had been lifted following the war, so architects and builders embraced natural stone, unique brickwork and varieties of timber. The floor plans were designed to address the surrounding environment rather than being a stock design from a display home. Living areas and even bedrooms connect to the outdoors while clever design creates privacy without shutting properties off the street and neighbourhood. Then there were the gardens. Houses were designed to retain as much of the natural character of a site as possible. Robin Boyd himself made the connection between modernist architecture and Australian natives – ‘Modern houses and Australian trees have been practically inseparable from the first moment they met’ (Aitken 2010, pp 169-171). A site specific design that worked with existing contours allowed existing canopy trees to be retained, rather than one erase-all-and-start-again excavation to suit a display home plan. In both my work and my interest in mid-century design, I continually come across people who are similarly attracted to this era and style. Articles are written constantly in places such as Domain (eg. here or here) that embrace the wonder of midcentury design. Therefore I am still amazed to see real estate agents promoting a midcentury property based on the size of the land or its potential views. 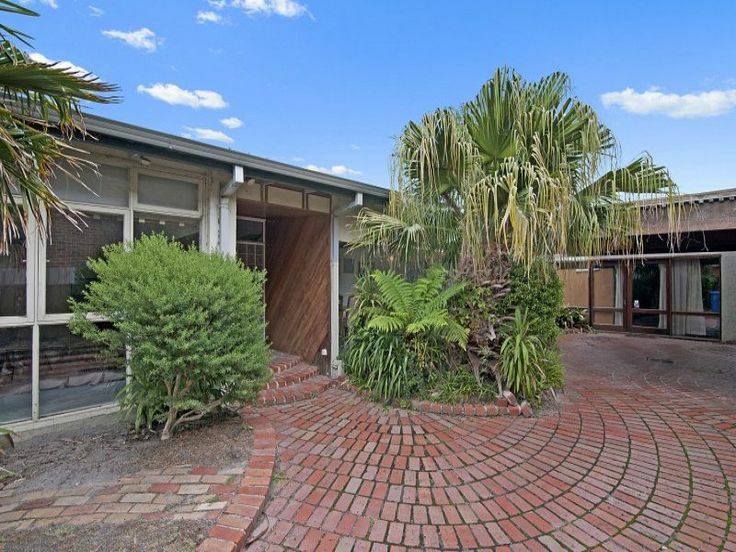 Surely they can make the connection that there is a market for selling a solid and even modest midcentury house if they promote it correctly. People are interested in the history of places such as Beaumaris / Balwyn / Caulfield and they are excited about the prospect of owning a home that, while maybe not designed by Boyd / Grounds / Chancellor & Patrick, was designed and built in a period that is known for its quality and longevity. I am fully aware that not every midcentury house should definitely be kept. S0me that I have seen are unfortunately well beyond repair and would be a huge undertaking both financially and emotionally to restore. However, there are many out there that are purely in need of a cosmetic birthday and from my own experience, it doesn’t take much to replace carpet, improve window coverings and slap on a fresh coat of paint. And it is a bit of a mystery. There are no shots from the front and exterior shots are pretty limited. What does stand out however, is some great midcentury features such as timber panel walls and plenty of floor to ceiling windows. Great views to the garden from the main bedroom (which also features and interesting cork? wall). But then we find this gem! An amazing indoor / outdoor garden atrium! Another architecturally fascinating and structurally sound Beaumaris beauty. So worthy of retention in its own right and more than just land value. So to all my friends and followers in the mid-century appreciation network, please share this property and let’s keep growing the awareness of these mid-century homes. 7 Haydens Road Beaumaris Vic 3193 – House for Sale #119620923 – realestate.com.au. I love your post, I will recommend to all my followers. I agree with everything you’ve said. I can’t stand McMansions, and despite having four children we live quite happily in a Mid-Century house. It’s not huge but we don’t care. With minor renovations we can make the place a bit more livable but in terms of renovations, we intend keeping the plan as is. It’s filled with light and is as solid as a rock. The great thing about these homes is that have such clever floor plans that the space is used efficiently and means there is still space outside. It comes to a point where you don’t need ensuites and walk in robes for each and every person in the house! What a lovely home, I hope the new owners can see and preserve its beauty. We live in a small MCM and have extended, that way we enjoy the blend of iconic architecture and mod-comforts.